Always read the entire recipe and instructions before you begin, to make sure you have all of the ingredients, equipment and the time required to prepare your recipe. Remember, the fresher, better quality ingredients you use, the better tasting desserts you will have. I highly recommend using the best quality butter, cocoa powder for chocolate desserts, and a great pure vanilla extract (I always use Madagascar bourbon pure vanilla extract or paste, but you can even use seeds from a vanilla bean to take it to the next level). To bring to room temperature quickly, microwave milk in 10-15 second intervals until no longer cold, stirring in between. Using cold milk can cause your batter to look curdled when added to the other room temperature ingredients. Milk: The fat content in the milk you use will affect the outcome of your recipe. The higher the fat content, the better flavor it will lend to your baked good. When using regular milk, I usually opt for whole milk for the richest, most moist outcome. If a recipe does not state which type of milk to use, generally if is safe to stick with whole or 2% milk. I rarely use fat-free or skim milk for baking. Cream: Heavy cream, also called heavy whipping cream is the richest of the creams, with the highest fat content. Both light and heavy whipping creams will whip up into a nice sturdy whipped cream, while half and half (made of half milk and half cream) and light cream do not have a high enough fat content (30% minimum) to whip up into a nice fluffy whipped topping, but are great for using in baking or using as the liquid in American buttercream frosting recipe for a little extra richness. Buttermilk: I love to use buttermilk in baking. The acidity in buttermilk tenderize the gluten formation in your recipe, yielding a softer, more tender baked good. In addition to giving baked goods a nice texture, buttermilk also lends a rich tangy flavor. It usually comes in a low-fat variety these days and has a thicker consistency than regular milk. Click here to learn all about buttermilk and watch the video for how to make buttermilk substitute with just 2 simple ingredients! When not stated, most recipes use large eggs by default. Eggs are mainly used as a leavening agent and an emulsifier to help bind the fats with the liquids in your batter. Eggs add flavor, richness, color, structure and texture to your baked goods. Eggs should be at room temperature, unless otherwise noted, when adding them to your recipe to promote even baking and to ensure the egg is easily dispersed throughout the batter without over beating. To bring whole eggs to room temperature quickly, place cold eggs (not cracked) in a bowl of warm water for about 5 minutes, or until they are no longer cold to the touch. Dry the eggs with a paper towel before cracking. The yolks primarily add richness from the fat and help bind the ingredients. 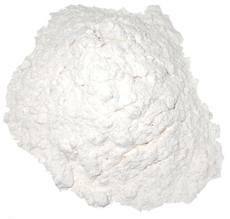 The whites do not contain any fat (used in many fat-free/low-fat baked goods). Egg whites help strengthen the structure of your baked good and add volume and height, but can also dry out your recipe. The egg white alone (without any trace of the yolk) can be whipped up to almost 8 times their size (like when making meringue cookies)! In some recipes, the eggs are divided and the whites are whipped and folded into the batter at the end to make the cake lighter and fluffier. Whole eggs whipped with sugar are also sometimes used as the leavening agent instead of baking powder/baking soda. Oil typically yields a more dense, heavy, yet moist baked good. Shortening or lard yield the most tender or flaky and moist baked good. Butter is somewhere in the middle with a nice tenderness, while margarine yields the least amount of tender, moist, flakiness in your baked goods. Butter adds the most flavor and richness to your baked goods, with margarine and butter flavored shortening adding some flavor and vegetable shortening, vegetable oil and lard adding virtually no flavor to your baked good. Unsalted butter is usually called for when not specifically stated but salted butter can be used in its place by reducing the amount of salt in the recipe by 1 teaspoon per pound of butter. 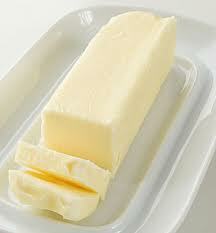 Margarine: Margarine usually comes in tubs or sticks. It is an oil based spread made of vegetable fat and water and typically contains salt. I do not recommend baking with margarine as it will not lend the same quality and taste that you get from butter. Shortening: Vegetable shortening (or "Crisco" as labeled in the grocery store) is a solid fat made from vegetable oils, such as soybean and cotton seed oil. It is virtually flavorless but also comes in butter flavored variety. Shortening is ideal for making pie crusts or pastry, since it blends well with flour or a stiff buttercream frosting since it has a high melting point and remains more solidified at room temperature, however I recommend using at least half butter, half shortening in an all shortening recipe to maintain a nice flavor. Oil: Vegetable oil is the most common oil used in baking. Some recipes call for olive oil, but it is not recommended in baking unless called for because it lends a stronger flavor to your baked good than a typical mild oil with a neutral taste. Some common, neutral tasting, all-purpose oils that are good for baking are: vegetable oil or canola oil (most commonly used), corn oil, safflower or sunflower oil. Vegetable oil also come in non-stick spray cans that are great for spraying the pan. You can alternatively fill a non-aerosol spray bottle with oil of your choice to coat pans, for an simple, affordable, refillable option. Flour is either made from wheat or non-wheat ingredients (grains, nuts, legumes, etc.). Non-wheat flour is a common ingredient in gluten free baking, while wheat flour is the more common type of flour and a staple in most home pantries. Flour is one of the most common ingredients in baking. Using it incorrectly can turn your baked good form a masterpiece into a disaster. Even a few extra ounces of flour can drastically compromise the outcome of your baked goods. Flour helps give volume and provide support and structure in baked goods. Flour can also be used for dusting pans before baking and coating nuts, fruit, and mix-ins before adding to the batter to prevent them from sinking to the bottom during baking. In baking, the type of flour used will drastically affect the outcome. Flour contains protein (which creates gluten), in either higher or lower levels. Different types of flour have different percentages of protein. When flour is mixed with the liquid in the recipe, the proteins in the flour bond together causing gluten to form, producing toughness and elasticity in your baked good. The leavening agent (usually baking powder or baking soda and sometimes yeast) then fills that gluten with air pockets. As your baked good is heated in the oven it will rise even more until the gluten sets, giving a fluffy and spongy structure to dense, wet dough. When the recipe simply states "flour", all-purpose flour is usually called for. If your recipes says "x cups flour, sifted", measure first, then sift. If your recipe says "x cups sifted flour", sift, then measure. By scooping the flour into your measuring cup, straight from the bag, the flour becomes packed into the cup and will result in too much flour in your recipe. Too much flour will result in a tough, dense and dry baked goods. This is one of the main factors in a recipe not coming out "right", and is a very common baking mistake made by so many at-home bakers. If the recipe calls for a "heaping" cup/teaspoon/tablespoon, leave a small mound of ingredient overflowing on top of your measuring cup/spoon and do not level off the top. If the recipe calls for a "scant" cup/teaspoon/tablespoon, do not fill the cup/spoon up to the top, leaving a small gap between the ingredient and the rip of the cup/spoon. It is always best to weigh out your flour using a kitchen scale for accuracy! If you don't have a scale, the next best method to get a more accurate measure is using, what I call, the fluff, spoon and level method (explained below). Cake Flour (6-8% protein content) has the lowest protein content, resulting in a more soft, tender, delicate crumb, so I like to use it for most of my cakes and cupcakes (To make your own cake flour see Ingredient Substitutions). Cake flour is made from soft wheat and has the lowest gluten content of any wheat flour. It is typically bleached and enriched. The bleaching process makes the protein a bit stronger in the flour, allowing it to hold the structure of a baked good with a large amount of sugar and fat without falling or collapsing in the center. Pastry Flour (8-10% protein content) Pastry flour has a slightly higher protein content than cake flour, yet it has less gluten than all purpose flour. It is perfect for making a tender yet sturdy pie crusts. It is usually unbleached (causing more spread in baked goods than a bleached cake flour). All-purpose (10-12% protein content) is a mixture of high and low gluten protein flours, used in the most diverse amount of recipes. It is the most common type of flour and can readily be found in most grocery stores. It can be found in bleached and unbleached versions (sometimes enriched), which are interchangeable. In baking, it is great for most cookies, cakes, muffins, biscuits, pancakes, and pastries. When the recipe simply states "flour", all-purpose flour is usually called for. Bread flour (11-14% protein content) is made exclusively from hard wheat flour. It can be found in bleached and unbleached versions (sometimes enriched). Its high gluten content gives it shape and structure, making it great for breads, pizza dough and muffins. Whole Wheat Flour (14% protein content) is made of ground hard wheat that is high in gluten, containing all of the nutrients found in the wheat kernel, such as wheat germ, bran. It has more fiber, protein and calcium than white flour, along with fewer calories and carbs. It yields a denser baked good, perfect for bread making. Most recipes work best when you substiture up to half the whole wheat flour in the recipe for all-purpose flour or bread flour. Whole Wheat Pastry Flour (9% protein content) is made of a low-protein soft wheat with whole grains incorporated. It has a lower protein content than whole wheat flour. It can be used in by substituting some of the all-purpose flour in most recipes for a healthy alternative. It is not as commonly used as most other types of flour. Both baking soda and baking powder are chemical leaveners (opposed to yeast, which is a natural leavener), in the form of white powder, that help baked goods rise in the oven, by enlarging the air bubbles in the batter while baking; however they cannot be interchanged in a recipe. Once you mix a batter, your baking soda or baking powder immediately begins producing gas, and if not baked right away (within about 15 minutes), the gas begins to escape and your baked good will not rise as tall, light and fluffy (however, baked good like my brownies or chocolate chip cookies, which do not use baking soda or baking powder as a way to get the batter/dough to rise, can be refrigerated for a few hours or overnight before baking to help the flavors meld together and develop for a more flavorful baked good). Baking soda is about 4 times as strong as baking powder, so you typically only need about 1/4 teaspoon per cup of flour in your recipe as opposed to baking powder where you need about 1- 1 1/4 teaspoon per cup of flour. 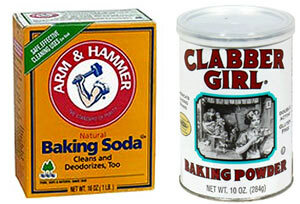 Baking soda is made of pure sodium bicarbonate, an alkaline powder (a base). It is used in recipes that contain an acidic ingredient, which include: applesauce, buttermilk, cream of tartar, honey, lemon juice, molasses, or natural chocolate and cocoa powder, sour cream, yogurt, vinegar, etc. When it is dissolved in the liquid in the recipe and combined with the acidic ingredient it reacts immediately to produce carbon dioxide bubbles, which further expand when you put it in the oven, producing a light and fluffy baked good. It also aids in the browning of your baked goods (like in pancakes and muffins) and is sometimes added even when their is no acidic ingredient in the recipe for it to work with (like in chocolate chip cookies), to simply lend a flavorful golden brown hue. Baking powder is made of baking soda combined with an acid and a starch (see my ingredient substitutions page for the baking soda, cornstarch, and cream of tartar mixture substitute. Unlike baking soda, it does not rely on an acidic ingredient to be activated. It is usually used in recipes with alkaline (a base) ingredients, like whole or skim milk and dutch processed cocoa powders (which contain alkali). Once you add your liquid to the recipe, the acid and base which make up the baking powder dissolve and create the air bubbles which cause your baked good to rise. When heated in the oven, more carbon dioxide bubbles form, producing a generally lighter and fluffier baked good than a recipe that uses only baking soda, because of the baking powder's "double acting" properties. However, too much baking powder can cause the carbon dioxide bubbles inflate too quickly, causing your batter to rise too much, and then collapse. While too little baking powder can result in a dense, heavy cake. It can also cause a metallic/bitter taste if used in excess. 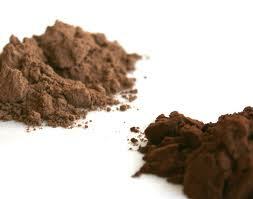 There are two main types of cocoa powder, Dutch-Processed Unsweetened Cocoa Powder and Natural Unsweetened Cocoa Powder. Dutch Processed cocoa powder is treated with an alkali to neutralize its natural acidity, so it must be used with baking powder (acidic) instead of baking soda for leavening. It is usually a little darker, with a reddish-brown tint, and has a more mild flavor than Natural cocoa and is easily dissolved in liquids. Brown Sugar: Click here to learn how to make homemade brown sugar from scratch right at home, using just 2 simple ingredients! Powdered Sugar (Confectioners' Sugar): 1 cup = 1 cup granulated white sugar + 1 tablespoon cornstarch, pulsed in a food processor until powder. 1 tablespoon honey = 1 tablespoon maple syrup = 1 tablespoon corn syrup; note that this will affect taste. 1 cup dark corn syrup = 3/4 cup light corn syrup plus 1/4 cup molasses, note that this will affect taste. To zest your citrus fruit, scrape the colored outer skin with a citrus zester or a cheese crater. Do not zest the white part of the rind, this part is very bitter and will add an unpleasant taste to your recipe. Always zest your fruit before cutting and juicing. To get the most juice from your citrus fruit, roll it around on your counter top, warm it in a microwave for 5-10 seconds, slice in half and juice either by hand or with a juicing tool. Lemon juice can be used with milk to create a buttermilk substitute. Lemon juice can also be used to prevent sliced banana, sliced apple, or guacamole/avocado from browning. One lemon yields about 1 tablespoon of zest. One large orange yields about 2 tablespoon of zest. About ten tangerines yields about 2 tablespoon of zest. Nuts/Berries/Mix-ins: If your baked good recipe calls for nuts or berries, toss them in with flour before adding to the batter. This trick will keep them from sinking to the bottom during baking. Baking with fresh fruit will also increase the baking time as a result from the extra moisture.